No conversation about stocks that can make you rich would be complete without this REIT and its spectacular record of performance. The most certain way to get rich by investing is to put your money in companies with strong dividend histories and great business models that consistently deliver market-beating performance. One great example of a company like this is Realty Income Corporation (NYSE:O), a real estate investment trust (REIT) that specializes in commercial properties, particularly properties that house retail businesses. A great monthly dividend, a spectacular track record of performance, and a winning business model makes Realty Income a great stock that can make you rich. Basically, Realty Income invests in commercial properties and rents them to stable, high-quality tenants, most of which (78%) are retail businesses. The company also has significant holdings in office, industrial, manufacturing, and agricultural properties, which combine to make up the other 22% of holdings. The company owns about 4,300 properties, all in strategic locations designed to maximize shareholder value. And it has worked so far. The occupancy rate of more than 98% (which has never been below 96%) shows that the company's properties are in very desirable locations. Realty Income also has an extremely strong group of tenants, spread out among 47 different industries. Among the largest are Walgreens, FedEx, Dollar General, LA Fitness, and Family Dollar, just to name a few. 46% of the company's tenants have an investment-grade rating (impressive for retail businesses), and no single tenant makes up more than 5.4% of the total revenue. Realty Income also pays a very healthy 4.7% dividend and makes monthly dividend payments, which allows your investment to compound faster. REITs like Realty Income make money for their shareholders in two different ways. First, they earn a steady, increasing stream of income in the form of rent collected from their tenants. And, this kind of income is much more predictable than that of, say, residential real estate like apartment buildings. Generally, retail tenants are on something called a "triple-net" lease. This means that the tenant is responsible for paying property taxes, insurance, and maintenance costs for the building. So, if property taxes spike by 25% one year, Realty Income doesn't care. All the company has to do is collect the agreed-upon rent amount and let the tenant worry about the fluctuating expenses. Plus, the lease terms are much longer. Retail tenants sign leases of five, 10, 15, or even more years, with annual rent increases built in, as opposed to the one-year leases that are typical in residential situations. In fact, Realty Income's average lease has 10.4 years left on it. This combination of low turnover and predictable rent is what has allowed the company to increase its dividend 77 times since it went public in 1994. Secondly, Realty Income makes money for its shareholders through the appreciation of its properties. Commercial real estate is much more predictable than residential. Property values are highly dependent upon the amount of rental income they are capable of generating. So, if a particular property has 3% annual rent increases built into its lease, its value should increase by roughly the same rate. Of course, there are other factors in play here, such as the condition of the property, how much land it's on, and location-specific real estate trends, but generally the appreciation is rather predictable. And, since Realty Income finances some of its properties (uses leverage), its actual growth rate is even higher. Basically, the company can make more money from properties than it costs to borrow money, which leads to higher investment returns. However, the balance sheet is rather conservative, with less than $5 billion in debt; a relatively small amount for a REIT with a market cap of $10.4 billion. So, investors shouldn't worry too much about the use of financing, as it really doesn't add too much risk. It's hard to argue with the kind of performance Realty Income has produced. 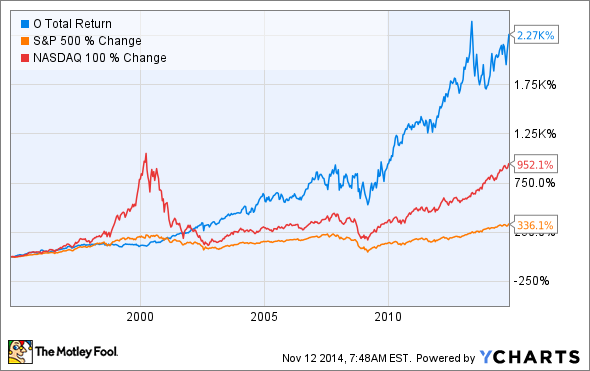 Since going public in 1994, the company has delivered an average annual return of 16.4%. This is an absolutely incredible rate to sustain over such a long period of time, and can really build up over the long run. To put this in perspective, consider that during the same time period, the S&P 500 averaged a total return of 9.5%, and the NASDAQ averaged 9.3%. Even Realty Income's peers, the equity REITs, "only" managed 10.9%..
Now, past performance is not a guarantee of future results, but I'm extremely impressed with the consistency of Realty Income's solid performance.The company has shown that it can perform well in both good markets and bad, so I have every reason to believe the company's strong results will continue well into the future. This is a company that definitely belongs in any conversation about stocks that could make you rich.